Don't miss out! Xtrend ET7100v2 DVB-C/T2 E2 Receiver only £49!! LAST REMAINING STOCK! Thread: Don't miss out! Xtrend ET7100v2 DVB-C/T2 E2 Receiver only £49!! LAST REMAINING STOCK! XTREND ET7100 V2 ONLY £49! SINGLE DVB-C/T/T2 CABLE / TERRESTRIAL TUNER! DUAL THREADING BROADCOM BCM73625 750MHz CPU! 256MB NAND FLASH / 512MB DDR RAM! MASSIVE ENIGMA 2 SUPPORT FROM OPENVIX, OPENATV, OPENPLI + MORE! 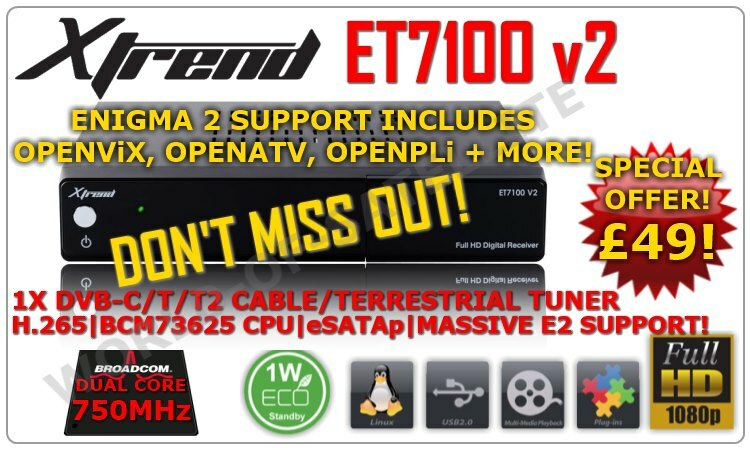 Stock of the ET7100v2 is now very limited, hurry don't miss out. Remaining stock won't last long!